There’s a new entry into the vegan dining scene in South Brisbane. Three-hatted chef and Fёnn Foods owner, Alejandro Cancino, and Brisbane Vegan Markets founder, Jonny Garrison, partnered together to create GrassFed. This small eatery on Fish Lane packs quite a punch with its humble selection of melt-in-your-mouth burgers and delicious ice cream that’s so good you’ll want to embrace the vegan lifestyle immediately. The gourmet burgers are made of the revolutionary vEEF™ patties, created by award-winning chef Alejandro Cancino and paired with a selection of sides such as fries and fried cauliflower. For drinks, GrassFed serves shakes topped with soy spray cream, Kombucha and soft drinks. Following the success of Alejandro’s vegan food venture, Fёnn Foods, Food Strategy was enlisted again to design and work on GrassFed. The challenge? Create a warm and comfortable space for people to enjoy their food within a compact tenancy. Sustainability and simplicity defines GrassFed’s front of house design. It espouses the cradle-to-grave theory where only sustainable materials were used for the premises. From the recycled iron cladding to the recycled timber used for the tables and shelves, every detail is made from sustainable material and produces minimal environmental waste. Even the cutlery is made of biodegradable materials. To soften the interiors and make it more inviting, the designers introduced a lot of greenery. Plants are strategically placed all over the premises to give it a more comfortable vibe. 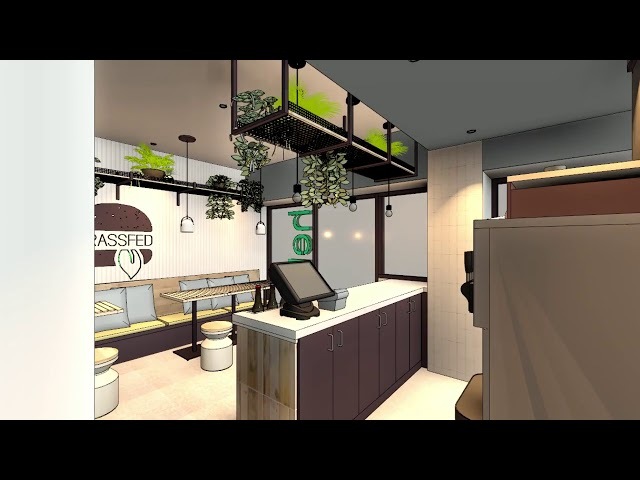 While seating may be limited given GrassFed’s compact space, the owners want to make sure that those who stop and dine in will enjoy their stay. GrassFed’s compact kitchen is built for efficiency. Most of the food preparation is done in a kitchen at the back which features an assortment of equipment handpicked to ensure the best fit for the limited workspace. The layout is pretty standard, with the refrigerators and freezers against the back wall and most of the equipment lining the sides of the kitchen. Because of the compact space, food gets quickly served to customers.